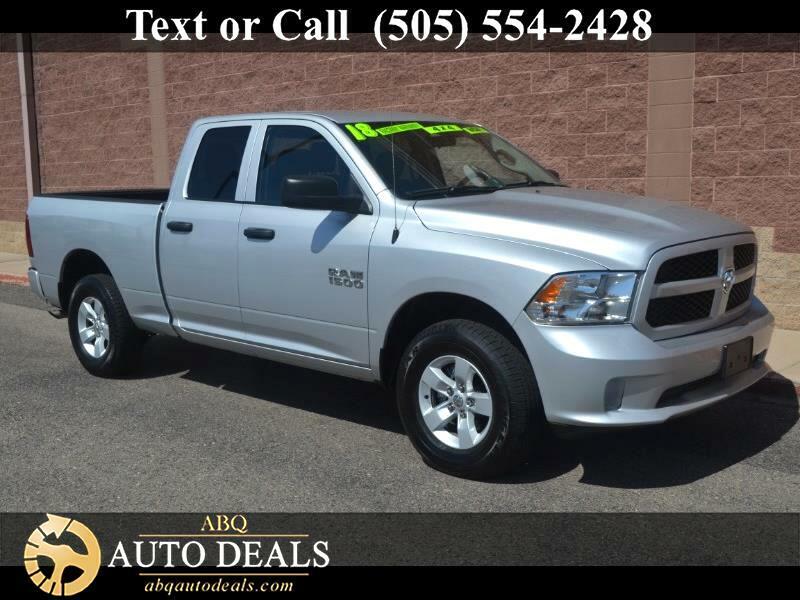 Our One Owner, Accident Free 2018 RAM 1500 Express Extended Cab 4x4 workhorse has a solid reputation in Bright Silver Metallic! Fueled by a 3.6 Liter V6 that offers 305hp matched to a rotary shifted 8 Speed Automatic transmission. Our Four Wheel Drive truck embodies hard work and smart design as it yields near 25mpg on the open road serving up a comfortable, no-nonsense ride with plenty of power to meet and exceed your demands. Our Express emphasizes helping you work smarter with automatic halogen quad headlamps, fog lights, tinted glass windows, bedliner, trailer hitch receiver, and a locking tailgate. Open the door to our Express and you will find that the interior was built to be a haven of comfort, yet it's incredibly durable and built to last. Enjoy air conditioning, steering wheel mounted controls, comfortable cloth seating, full power accessories, and the impressive Uconnect system that features voice command, Bluetooth, USB/AUX inputs, and a fantastic audio system to keep you connected and entertained. Once inside, you'll see it checks off all the boxes on your list and then some! Behind the wheel of our RAM 1500 rest assured that our robust truck has undergone extensive safety testing. It is well-equipped with a rear view camera, dynamic crumple zones, side-impact door beams, and an advanced airbag system. The epitome of a workhorse, our Express has you covered with the ideal blend of muscle, capability, security, and comfort! Print this page and call us Now... We Know You Will Enjoy Your Test Drive Towards Ownership! Your buying experience with ABQ Auto Deals is our number one priority.